1. Lipopolysaccharide hyporesponsiveness: protective or damaging response to the brain? Lipopolysaccharide (LPS) endotoxins are widely used as experimental models of systemic bacterial infection and trigger robust inflammation by potently activating toll-like receptors 4 (TLR4) expressed on innate immune cells. Their ability to trigger robust neuroinflammation despite poor brain penetration can prove useful for the understanding of how inflammation induced by viral infections contributes to the pathogenesis of neurodegenerative diseases. A single LPS challenge often result in a blunted inflammatory response to subsequent stimulation by LPS and other TLR ligands, but the extent to which endotoxin tolerance occur in the brain requires further clarification. LPS is also thought to render the brain transiently resistant to subsequent brain injuries by attenuating the concomitant pro-inflammatory response. While LPS hyporesponsiveness and preconditioning are classically seen as protective mechanisms limiting the toxic effects of sustained inflammation, recent research casts doubt as to whether they have beneficial or detrimental roles on the brain and in neurodegenerative disease. These observations suggest that spatio-temporal aspects of the immune responses to LPS and the disease status are determinant factors. Endotoxin tolerance may lead to a late pro-inflammatory response with potential harmful consequences. And while reduced TLR4 signaling reduces the risk of neurodegenerative diseases, up-regulation of anti-inflammatory cytokines associated with LPS hyporesponsiveness can have deleterious consequences to the brain by inhibiting the protective phenotype of microglia, aggravating the progression of some neurodegenerative conditions such as Alzheimer s disease. Beneficial effects of LPS preconditioning, however appear to require a stimulation of anti-inflammatory mediators rather than an attenuation of the pro-inflammatory response. Our review focuses on a new class of materials - three-dimensional (3D) dendritic gold nanostructures - and their potential in vivo and in vitro application. To better understand this class of materials and its properties, an overview on dendrimers and gold nanoparticles is needed. Dendrimers are known for their biomimetic properties and they are often compared with proteins due to their globular shape. Dendritic structures make excellent drug delivery systems and their ability to detect or target specific cells and to release active agents in a controlled manner when using adequate functionalization was already proven. Moreover, dendrimers can envelop other functionalized nanoparticles and create even more efficient targeting and release systems. Gold nanoparticles are already being used in the biomedical field in applications like sensing, photodynamic therapy, therapeutic agent delivery and diagnostics. Their high applicability is due to their optical properties, also called quantum size effect, given by the interaction between light and electrons onto the surface of the gold nanoparticles. There are three main types of gold dendritic structures: gold-dendrimer nanocomposites, dendrimer-entrapped nanoparticles (DENPs) and gold monocrystalline dendritic growths. Gold nanoparticles (AuNPs)-dendrimer structures combine the therapeutic properties of AuNPs with dendrimer s reactivity and biological membrane crossing ability. The incidence of hepatocellular carcinoma (HCC) has been constantly increasing over the last years mainly due to hepatitis C infection and cirrhosis. The new developments in imaging technology, including magnetic resonance imaging (MRI) and computed tomography (CT), allow a better diagnosis of HCC. Cirrhosis is characterized by formation of nodules from regenerative nodules to dysplastic nodules, followed by HCC. Thus, the differential diagnosis of hypervascular hepatic lesions is important, especially in the nodules smaller than 2 cm, although their characterization may be difficult even when histopathology is used. A multistep approach with the comparison of clinical data, pathological findings and imaging features is useful for a more accurate diagnosis. MRI has the ability to assess the same lesions features as CT and to better characterize the enhancement patterns of nodules combined with the lack of irradiation. Moreover, new liver specific contrast agents and imaging techniques as diffusion-weighted (DWI) sequences are available. Regenerative and low-grade dysplastic nodules demonstrate contrast enhancement similar to that of surrounding liver parenchyma, compare to high-grade dysplastic nodules, which may show arterial enhancement similar to that seen in HCC. We present a review of the MR imaging and histopathological features of hypervascular nodules in the cirrhotic liver, with reference to the transition from dysplasia to HCC. Soft tissue defects around the elbow are a real challenge in the field of reconstructive surgery. This anatomical region is passed by superficial noble anatomical structures (arteries, veins, nerves) that are often exposed in post-traumatic or post-excisional defects. The elbow joint has a high tendency to stiffness or ankylosis even after short immobilization. The pedicled perforator flaps, based on source vessels from the anastomotic arcades of the elbow seem to be an efficient and reliable reconstructive choice. The flap offers a good local coverage, replacing like with like, has minor donor site morbidity and contrary to the free flaps, allows the very early beginning of physical therapy starting with the first postoperative day. This paper represents a review of the literature concerning this problem. Colorectal cancer appears to be one of the most important malignancies in the world, with a survival rate depending on the TNM stage. The presence of lymph nodes metastasis indicates the necessity of adjuvant chemotherapy but exact classification of the N stage requires at least 12 lymph nodes to be pathologically examined. The sentinel lymph node (SLN) is considered to be the closest lymph node to the tumor, bearing the highest risk of malignant cells colonization. The main advantage of the sentinel lymph node mapping in colorectal cancer is identification and separate pathological examination of the nodes carrying the highest risk of metastasis. There are still open questions regarding the best method for sentinel lymph node mapping (in vivo or ex vivo), the factors influencing it, which substance is better for identification and which are the best histological methods and markers to be used. Numerous studies have discussed the quality and applicability of the method, but the importance of the SLN in colorectal carcinoma remains an open issue. Depression leads to disturbances in physiological rhythms, which result in disturbances in circadian sleep-wake cycles, hormonal secretion patterns and fluctuations in mood, all of which can be objectively measured. These disturbances, which are associated with depression, can be also used to define depression. Beyond these transversal time-related symptoms, there are the longitudinal time-related symptoms, since depression evolves over a long period of time, with a profound impact on a person s life and is often associated with long-term psychosocial consequences (Mendlewicz, 2010). The circadian rhythm reflects an approximate 24-hour cycle in the biochemical, physiological and behavioral processes of living entities, which crucially influences human well-being and health. Increasing evidence from clinical and neurobiological research suggests that disrupted temporal organization impairs behavior, cognition, mood, sleep and social activity and may be implicated in mental disorders. It has been proposed that circadian malfunction is a major core feature of mood disorders, depression in particular. In depressed patients, circadian rhythms and homeostatic processes are disrupted, thereby affecting mood, sleep, activity and a variety of biological functions such as hormone secretion and body temperature (Hajak and Landgrebe, 2010). Sleep difficulties are among the most current symptoms in depressed patients. Insomnia is often the reason why depressed patients seek help and relief of sleep disturbance may encourage compliance with antidepressant treatment. Apart from the discomfort that sleep problems produce, they may lead to exhaustion, poor functioning and they are associated with an increase in suicide risk (Wilson et al., 2013). Oral cancers still represent a major health problem; regional lymph node metastases occur in 30-40% of head and neck squamous cell carcinomas and are associated with unfavorable prognosis and decreased survival. The study included 35 cases of oral squamous cell carcinomas (OSCC), which were analyzed by double reactions to determine the proliferative activity (anti-human D2-40/Ki67) and the maturity degree (anti-human D2-40/alpha-SMA) of lymphatic vessels, both intratumoral (IT) and in the advancing edge (AE), and in relation to clinicopathological prognostic parameters. The mean values of D2-40 lymphatic vessel density (LVD) were higher in AE then in IT level. Poorly differentiated carcinomas, T3/T4, presented the highest LVD values, both IT and in the AE. LVD was higher in advanced stages and metastasizing carcinomas. Ki67 was positive in all cases, Ki67 proliferation index (IP) indicated higher values in poorly differentiated carcinoma, T3/T4, metastasizing ones, both IT and in the AE. LVD and IP Ki67 showed a positive linear correlation. D2-40/Ki67-positive vessels were identified only at the AE or close to it. D2-40/Ki67 LVD had highest values in advanced stages carcinoma, with metastases. D2-40/alpha-SMA-positive vessels were identified only in the neighborhood of the tumor and LVD highest values were present in early-stage carcinomas and without metastases. A negative linear correlation between proliferation and maturity of the lymphatic vessels was found. The study indicated a strong association between lymphatic proliferative activity and lymph node metastases, suggesting the need for targeted antilymphangiogenic therapies in OSCC. Aim: The authors continue a started series of articles about extrapulmonary tuberculosis (EPTB) with the assessment of the mycobacterial lesions discovered on tissue samples of the oral cavity structures in the Department of Pathology of the Emergency County Hospital of Craiova, Romania, and the review of the cases reported in the literature available, between 1990 and 2013. Materials and Methods: The studied material consisted, for our series, of samples obtained by biopsy or surgical excision, including the salivary glands and excluding the lymph nodes from 17 patients histopathologically diagnosed with tuberculosis and, for review series, 190 papers selected from PubMed database. Results: The number of cases reported increased throughout the studied period. Most cases came from departments connected with oral pathology but also from various medical and surgical departments. In general, patients were adults with a mean age of around 40 years, with twice as many men than women, without no information or no clinical suspicion of tuberculosis (TB) at the admission. When reported, the provisional diagnostic was oriented most often towards neoplastic proliferation. There was no information about human immunodeficiency virus (HIV) testing in more than half of the case reports but when existed the result was two-fold more frequently negative than positive. TB lesions of the oral cavity were more often primary infections than secondary. From morphological point of view, the granuloma cellular population included both epithelioid and Langhans cells in most of the cases, the necrosis, present in most of the cases, displayed the whole range of morphological features, but mainly the acidophilic, microgranular one and the perilesional fibrosis was absent in almost all of the cases. As a whole, well-differentiated granulomas were the most frequent, usually of grade II - reactive type (homeostatic) but with a significant contingent of grade I - hyperplastic (protective) granulomas. Local extension was usually not present and, when present, regional lymph nodes were mainly involved. Coexistence of TB lesions with a neoplastic proliferation was very rare and when present it was mainly located in the parotid gland. Apart from this general profile, particular, individual profiles were observed for each of the oral cavity segments. Conclusions: TB lesions in the oral cavity are indeed a rare event but no swelling or ulcer in the oral cavity should be disregarded by the medical practitioners because it could be tuberculosis. Introduction: Placenta can become an attractive source of stem cells due to its known richness in cell number and accessible, non-invasive procedures to harvest them. The purpose of this study focuses on the pluripotecy of placental-derived mesenchymal stem cells through differentiation towards osteogenic and neurogenic lineages. Materials and Methods: The biological material was represented by populations of human mesenchymal stem cells isolated from chorionic villi (h-CMSCs) and amniotic membranes (h-AMSCs) of full-term placenta. The potential of h-CMSCs and h-AMSCs was assessed trough growth kinetics, differentiation towards osteogenic and neurogenic lineages and immunohistochemistry. Results and Discussion: Human chorionic and amniotic mesenchymal stem cells are CD44+ (adult mesenchymal stem cell marker), CD45-, CD34- (adult hematopoietic stem cell markers) and display specific osteogenic and neurogenic morphology. The immunohistochemistry assays show the presence of Osteopontin+ and Osteonectin+ cells (osteogenic differentiation) as well as Synaptophysin+, GFAP+ and S100+ cells (confirming the glial differentiation) and NSE+ cells, indicators of neuronal differentiation. Conclusions: Placental-derived mesenchymal stem cells show remarkable differentiation potential under appropriate culture conditions. The expressions of osteogenic and neurogenic markers support the conclusion that placenta is an excellent mesenchymal stem cell source for osteogenesis as well as neurogenesis. Future research in this area will identify the best clinical applications for this new source of stem cells. Cutaneous dendritic cells play multiple physiological roles and are involved in various pathophysiological processes. Research studies of dendritic cells abound in the medical literature. Nevertheless, the role of dendritic cells in melanoma regression phenomenon is not completely understood. We conducted a scientometric analysis in order to highlight the current state on research regarding dendritic cells and melanoma. We also performed an immunohistochemical study, using specific markers for dendritic cells (CD1a, langerin). We evaluated the frequency and distribution of dendritic cells in areas of tumor regression compared to the areas of inflammatory infiltrate of melanoma without regression. The immunohistochemical study we performed revealed that dendritic cells are more frequent in the regressed areas, comparing with non-regressed ones. In regressed areas, dendritic cells have a predominant nodular pattern (19 cases), followed by diffuse isolate pattern (eight cases) and mixed pattern (diffuse and nodular) (three cases). In melanoma without regression, most cases presented a diffuse pattern (27 cases) of dendritic cells distribution. In conclusion, our immunohistochemical study stressed differences between frequency and distribution of dendritic cells located in the melanoma with regression and melanoma without regression. These data suggest that dendritic cells are involved in the regression phenomenon. Following the literature analysis we obtained, we observed that dendritic cells profile in melanoma with regression was poorly studied. Insights into antitumor immune response and dendritic cells may be essential for the understanding of the potential prognostic role of dendritic cells in melanoma and for the development of new promising therapeutic strategies for melanoma. The placement of dental implants in the posterior region of the maxillary may pose some difficulties caused by the quality and particularly, the quantity of the subantral bone reserve, which are overcome by subantral bone augmentation. The current study performs a comparative evaluation of the quality and especially, of the stability of alloplastic and autologous materials used for subantral bone augmentation. This study included 21 patients who underwent subantral bone augmentation with alloplastic and autologous material. The patients were followed-up over a 24-month period after bone augmentation, during which the osseointegration rate of dental implants and the stability of subantral grafts were evaluated. The rate of failure of dental implants placed in autologous material grafts was 1.89% (0.036+/-9.398), while the rate of failure of those placed in alloplastic material was 7.69% (1.960+/-19.194). Bone resorption was higher within 12 months of dental implant placement both for the alloplastic material (9.87+/-3.76%) and the autologous material (18.87+/-3.25%), while 12-24 months after bone augmentation it diminished. The implants placed in the autologous bone grafts had a lower rate of failure compared to those placed in the alloplastic material grafts; in contrast, alloplastic material had a lower resorption rate compared to autologous material. Our study aimed to quantify serum VEGF (vascular endothelial growth factor) and its inter-relation with the severity of microvascular damage, assessed by nailfold capillaroscopy (NC), and to establish the possible relationship with disease activity score. We included 18 patients, diagnosed with systemic lupus erythematosus (SLE) and 17 gender and age-matched control subjects. For determining serum VEGF, we used a Human VEGF Assay kit-IBL. NC was performed, according to the standard method, using a video-capillaroscope Videocap 3.0, DS Medica, by the same examiner, blinded to clinical and laboratory data. Serum VEGF registered a mean value of 68.99+/-71.06 pg/mL for SLE patients and 31.84+/-11.74 pg/mL for controls, differences statistically significant; depending on disease activity, we found a mean value of 60.11+/-57.74 pg/mL, for patients with moderate disease activity vs. 30.96+/-11.51 pg/mL for the ones with a low activity (p=0.014). We found a moderately positive correlation, statistically significant (p=0.015), between serum level of VEGF and Systemic Lupus Erythematosus Disease Activity Index (SLEDAI). Performing NC, we found changes in 88.88% of the patients; the most frequent were increased tortuosity, dilated capillaries, an increased length and a prominent subpapillary plexus. The presence of nailfold capillaroscopy changes and serum level of VEGF, correlated moderately, positive. Since serum levels of VEGF are higher in SLE patients, compared to controls, significantly different according to disease activity degree, and directly inter-related to abnormal NC patterns and a more active disease, we can include these accessible parameters in the routine evaluation, in order to better quantify the systemic damage, individualize the treatment, improve the outcome and life quality for these patients. Localized duodenal neoplasms are relatively rare entities, most often representing invasions of the duodenum by malignant masses developed in the duodeno-pancreatic region. The paper makes a more exact analysis of radiological semiology of duodenal localized tumors and seeks to determine through this analysis the role of radiological examinations in the support for the anatomopathologist. The study group included 17 cases of duodenal localized tumors, nine cases of which have been shown to be vaterian ampulloma and eight malignant tumors of the duodenum. All cases were CT (computed tomography) examined and two-thirds were performed conventional radiological examinations, prior to CT examination. Pre-operatively, all cases were evaluated endoscopically, and in three of them bile prostheses were made. CT examination protocol included a native acquisition and post-administration of intravenous contrast agent in both the arterial phase and in parenchymal and venous phase. The acquisition was made with 3 mm thin sections, subsequently coronal and sagittal plane reconstructions being made. The paper tries to establish possible correlations between the morphopathological aspect and the radio-imaging semiological characteristics of lesions. Objective: The main rationale for treatment failure and death of the patients with oral squamous cell carcinoma (OSCC) is loco-regional recurrence, development of second primary tumor (SPT) and metastasis, which could be well explained by concept of field cancerization. Identification of patients at high risk for development of SPT is an important part of research for cancer management. This study was designed keeping this aspect in mind and utilizing the increased expression of p53 as an indicator of existence of altered fields in mirror image biopsies of OSCC patients. Design: Forty clinically diagnosed oral cancer patients were included in the study. Biopsy tissue samples from clinically diagnosed oral cancer patients (Group A) and the mirror image, clinically normal looking mucosa at corresponding contralateral anatomical site (Group B) were studied for histopathological evaluation and p53 immunoexpression. Results: Tissue alterations were observed in Groups A and B. There was statistically significant (chi-square value - 126.6, p=0.0001) difference in grades of epithelial dysplasia and p53 immunoexpression in Group B. Spearman s Rank Correlation Coefficient shows non-significant positive correlation between epithelial dysplasia and p53 (r=0.28, p=0.05) in Group B. Conclusions: Evidence of presence of field cancerization, evaluated by histopathological alterations and enhanced p53 expression was observed in mirror image biopsies of OSCC patients. This could predict the altered state of oral mucosa secondary to carcinogen exposure. The realization of a genetically altered field as a cancer risk factor provides a new paradigm. It would be prudent to keep these patients under close observation and to advice them chemotherapeutic regimes. The purpose of this study was to evaluate the topography of the saphenous nerve branches and of the popliteal neurovascular bundle of knee and to establish a low risk placement position of the posteromedial knee portal (PmKP). A slice anatomy study, by using plastinated transparent knee cross-sections was performed on 12 intact right male cadaver lower limbs. The measurements were performed at the level of the medial epicondyle (MEc), at the joint line level and at the level of the tibial attachment of the posterior cruciate ligament (PCL). The popliteal artery (PA) is predicted to be 8.66+/-2.17 mm dorsal and the sartorial branch of the saphenous nerve (SBSN) at 4.27+/-0.05 mm posterior to the joint capsule at the level of the MEc. At the joint level, the PA is 7.86+/-2.26 mm away from the PCL and the SBSN is predicted at 2.41+/-0.12 mm posterior to the joint capsule. At the level of the tibial attachment of the PCL, the PA to PCL the distance is 5.93+/-3.61 mm and the SBSN is situated at 4.36+/-0.43 mm posterior to the joint capsule. Based on our anatomic data, a PmKP placed at the level of the MEc appears to be safe, effective, and reproducible. At the level of MEc, the PA is situated widely lateral to the MEc and the distance between the saphenous nerve branches and the articular capsule is greater than on the other levels. This study suggests that by placing the PmKP at the level of MEc, the risk of neurovascular injuries could be reduced. Wharton s jelly mesenchymal stromal cells (WJ-MSCs) derived from human umbilical cords could be an appropriate candidate for hepatocyte replacement therapy. Improvement of the efficiency of the cell expression of liver specific genes can be considered in finding new transplantation resources. The present study aimed to differentiate WJ-MSCs toward hepatocyte-like cells on collagen film in the presence of hepatogenic factors, including fibroblast growth factor 4 (FGF4), hepatocyte growth factor (HGF), and insulin-like growth factor-1 (IGF-1). MSCs derived from Wharton s jelly explants were characterized by flow cytometry. Then, the cells were cultured in the presence of hepatogenic media with or without FGF4 on 2D collagen films for 21 days. The expression of liver-specific genes was evaluated by real-time polymerase chain reaction (RT-PCR) and immunocytochemistry. The functional assays were performed by Periodic Acid-Schiff (PAS) staining and Indocyanin Green (ICG) uptake. The cultures pre-exposed to FGF4 expressed higher levels of endodermal markers, such as albumin, compared to the control cultures. Also, cytokeratin 18 expression was significantly increased in FGF4-treated cells. However, the expression level of other liver-specific markers was not influenced by exposure to hepatogenic media with or without FGF4. In conclusion, it was demonstrated that FGF4 could induce the differentiation of WJ-MSCs toward endoderm. Despite the morphological changes and increase in PAS reaction, WJ-MSCs could not differentiate into hepatocytes by hepatogenic media consisting of IGF-1. The purpose of this study was in vitro evaluation and comparison of the adhesion of self-etch (SE) adhesive systems applied on normal and sclerotic dentin. For this study, Class 5 cavities were prepared on sound teeth as well as on teeth with sclerotic dentin. They were then restored by means of the SE 2-step OptiBond XTR (Kerr) and SE 1-step Bond Force (Tokuyama Dental) adhesive systems, as well as the Estelite Sigma Quick (Tokuyama Dental) composite resin. For teeth with sclerotic dentin, the hypermineralized superficial layer was removed by means of round bur on low speed, than the adhesive systems and composite resin were applied. These teeth were prepared for microscopic study according to the protocol specific to each microscope. SEM (scanning electron microscopy) examination reveals that on normal and sclerotic dentin, OptiBond XTR and Bond Force form hybrid layers with about the same thickness, greater in normal dentin, but only OptiBond XTR pervades into the dentinal tubules, both in normal and sclerotic dentin. However, TEM (transmission electron microscopy) examination of Bond Force reveals that it penetrates into the dentinal tubules as well, but only in the case of normal dentin. The thickness of the hybrid layers resulting from the application of the SE adhesive systems to sound dentin is different from the thickness of the hybrid layers obtained when the same adhesive systems have been applied to sclerotic dentin. Objective: This article deals with determination of changes in the structural organization of vascular tunic of the eyeball under the effect of opioid. Materials and Methods: The study was carried out on 24 mature white male rats aged 3.0-4.5 months and 170-280 g weight. The research material included histological specimen and semi-thin sections of white rats eyeball vascular tunic. For the histological study, microscopic sections of the eyeball were stained with Hematoxylin and Eosin, Heidenhain s Azan trichrome. Specimens were studied and photographed with microscope magnification: x600, x1000. Results: The first signs of microstructure disorder in all parts of vascular tunic of the eyeball are noticeable after two weeks of nalbuphine injection to the white rats. During the next four weeks of the experiment, the pathological changes increase and are manifested by the swelling and polymorphonuclear infiltration of the iris, ciliary body, choroid and by deep destructive changes of eyeball hemomicrocirculatory bloodstream. Histological and ultramicroscopic studies of the white rats eyeball vascular tunic after six weeks of nalbuphine injections showed deep destructive changes in the structure of all parts of vascular tunic. Conclusions: Our study demonstrated a negative effect of the prolonged injection of opioid in the experiment on the state of microstructural organization of the eyeball vascular tunic. Development of angiopathy is the triggering for occurrence of destructive changes in the eyeball under the effect of opioid. The tremendous research effort of the last decades added a new, epigenetic layer of complexity to the already complex image of prostate cancer pathogenesis. Here we use quantitative real-time polymerase chain reaction (qRT-PCR) to investigate the expression of the microRNAs resident on chromosome 21 (miR-ch21) in laser capture microdissected (LCM) tissues from formalin-fixed paraffin-embedded (FFPE) archived, prostate adenocarcinoma samples. We show a strong, specific down-regulation of miR-ch21 in tumoral epithelia and stromae as compared to normal counterparts, results at odd with the current paradigm on the involvement of these microRNAs in prostate oncogenesis. By comparing this result with the expression of two well-known pluripotency associated microRNA, hsa-miR-372 and miR-373, we suggest that miR-ch21 down-regulation might be the result of specific silencing of miR genes mapped to chromosome 21. Further studies, of larger sample size are needed to confirm our preliminary data. The histological changes of the oral mucosa in contact with a metal alloy dentures is one of the current issues widely debated in the literature. Aim: To highlight the expression of vascular endothelial growth factor (VEGF) in human paraprosthetic gingival mucosa exposed to nickel and copper compounds using the immunohistochemical technique. The selected participants were wearers of fixed dentures made of nickel-based alloys and copper-based alloys. The gingival mucosa fragments were prelevated through excision after removing fixed denture and extraction one of its affected teeth. The gingival mucosa fragments were processed through the histological technique of paraffin inclusion. The paraffin-embedded tissue sections were usually stained with Hematoxylin-Eosin and processed by immunohistochemical technique with VEGF antibody. The gingival mucosa fragments from nickel-based alloys dentures wearers were diagnosed with papilloma and, also, gingival mucosa samples prelevated from copper-based alloys dentures wearers were diagnosed with condyloma acuminata. Immunohistochemical reaction for VEGF was different in the gingival mucosa fragments with papilloma compared with condyloma acuminata samples. In papillomatosis gingival mucosa fragments, VEGF was implicated in principal in vasodilatation and inflammation process, and secondary in angiogenesis. In gingival mucosa fragments with condyloma acuminata, the principal role of VEGF was in angiogenesis and secondary in inflammation. The role of the subchondral bone and the importance of treating both bone and cartilage in cases of chondral and osteochondral lesions of the knee have been highly emphasized. There are no current studies on the experimental use of bioactive glass S53P4 (BonAlive) as granules in the treatment of osteochondral lesions of the knee. Our preliminary study was designed to establish an experimental model and assesses the effect of glass granules fixed with fibrin compared to fibrin alone as fillers of the osteochondral defects created in the weight-bearing and partial weight-bearing regions of the distal femur in six adult rabbits. We found that the size of the distal femur in adult domestic rabbits allows the creation of 4 mm diameter and 5 mm deep osteochondral defects on both the medial femoral condyle and the trochlea, bilaterally, without significantly affecting the activity level of the animals. Retention of the glass granules in the defects was achieved successfully using a commercially available fibrin sealant. At five weeks post-implantation, we found macroscopic and microscopic differences between the four types of defects. The use of bioactive glass S53P4 for filling condylar osteochondral defects in rabbit femora led to the initiation of an early bone repair process, observed at five weeks after implantation, while the filling of trochlear defects with fibrin glue resulted in the appearance of cartilaginous tissue characteristic of endochondral ossification. The study aimed to assess the short-term effects exerted by two inorganic arsenic species (arsenite and arsenate) on Artemia salina after 24, 48 and 72 h. The dose-lethality curves obtained indicate that the lethality induced by arsenite was higher than by arsenate. The lowest observed effect concentration for arsenite (0.5 micro-g/mL) is similar with the no observed effect concentration for arsenate, thus indicating that the toxicity of arsenite is higher compared with arsenate. Also, the lethal concentration 50 values confirm that arsenite induced about 1.24-fold higher toxicity than arsenate at 24 h and about three-fold higher toxicity at 48 h and 72 h of exposure. Both LC50 (lethal concentration 50) values are indicating negligible effects exhibited by arsenic at this trophic level after short-term exposure. The predicted no effect concentration in the surface aquatic compartment corresponds to 10.38 micro-g/L, similar to the limit imposed by Directive 98/83/EC. In the last years, only few studies focused on the role of tight junctions in human peripheral nerve. This type of junction is found between apposed membranes of myelinating Schwann cells, between perineurial cells and between endothelial cells (of the epi-, peri- and endo-neurium vessels). We investigated the presence of claudin-1 and occludin in peripheral nerve biopsy of patients with demyelinating peripheral neuropathies by immunolabeling (immunohistochemistry and immunofluorescence) and Western blot. Immunolabeling highlighted claudin-1 expression mostly in the tight junctions of the perineurial cells and in the autotypic junctions of the Schwann cells of the patients with demyelinating peripheral neuropathies. Occludin was mostly expressed in the tight junctions of perineurial cells and endothelial cells and only faintly in autotypic junctions of Schwann cells. The Western blot data showed significant differences in claudin-1 and occludin expression levels in patients with demyelinating peripheral neuropathies versus normal unaffected control. Our results show that autotypic tight junctions molecular composition, like claudin-1 and occludin expression could influence the demyelinating process by altering the permeability of the blood-nerve barrier. Background: Monitoring the effects of treatment in malignant diseases is very important in study of the influence on the cell metabolism. Energy production in cancer cells is abnormally dependent on aerobic glycolysis. In addition to the dependency on glycolysis, cancer cells have other atypical metabolic characteristics. The purpose of the present study is to evaluation and analysis of the colon cancer cells under anti-angiogenic treatment, to establish the changes in the cellular energy metabolism and apoptotic potential. Anti-angiogenic drugs block the vascular endothelial growth factors, preventing the formation of new vessels. Materials and Methods: We use immunohistochemical analysis of cytochrome c release and histoenzymatic analysis of adenosine triphosphatase (ATP-ase), succinate dehydrogenase (SDH), lactate dehydrogenase (LDH) enzymes. Colorectal tumor tissue samples were obtained by biopsy following the surgical procedures at the County Clinical Hospital of Oradea (Romania). Results: The obtained results show that the apoptotic potential of malignant cells increases during the anti-angiogenic treatment, in the same time the rate of glycolysis increases, due to installed hypoxia and reduced ATP synthesis. Our results have been confirmed by international studies too. Conclusions: It was been demonstrated that the apoptotic potential of malignant cells increases significantly during anti-angiogenic treatment. There is growing evidence that cancer s Achilles heel is tumor cell metabolism. Ischemic stroke is a disease of aging and causes high mortality or long-term disability. Diminished neurological recovery after stroke in aged subjects is possibly associated with exaggerated non-specific inflammatory reaction. The focus of the present study was on neurobiological and behavioral differences between young and old rats modulated by indomethacin daily treatment starting at four hours after acute cerebral ischemia in animal model. Our results indicate age-independent positive consequences of non-specific inhibition of inflammation by indomethacin including increased NeuN-positive surviving neurons, reduced infarct volume and enhanced neuroprotective response of innate immune system evidenced by increased Iba1 and Anx3 immunoreactivities and moderately activated microglia in the peri-infarcted area. Quite relevantly, the efficacy of therapy with indomethacin was reduced. In the aged rats, specifically indomethacin is ineffective in inhibiting phagocytic activity, which is probably due failure of the aged brain to up-regulate the expression of several cytokines including TNFalpha and Cxcl4. At protein level, we observed no change of lysosomal ED1 immunoreactivity under treatment. Our study demonstrates the beneficial anti-inflammatory treatment with indomethacin. However, aging blunted the positive effect. Objective: Orthodontists use various biomaterials such as molar bands, brackets, archwires, transpalatal archwires, facial masks and other auxiliary devices. One of the essential properties of these materials should be the biocompatibility. The aim of this study was to evaluate the biocompatibility of some orthodontic biomaterials like stainless steel archwires, brackets and NiTi (nickel-titanium alloy) coil springs. Materials and Methods: The studies were performed in vitro using human fibroblasts cultures on which the orthodontic materials were applied. The positive control was the copper amalgam. Readings of the cell reactions were performed at three and six days. Results: It was observed that the materials used in the study cause cell alterations of variable intensity. The metallic brackets represent an important cell stress factor causing shape changes. For the metallic brackets, a preferential tropism for different areas of the bracket was also obvious. We observed a preferential tropism for the areas between the NiTi coil spring spirals. For the stainless steel archwires, we observed at six days a decay of cell density and also a higher amount of cells near the archwire areas on which bends were performed. Conclusions: All biomaterials analyzed in our study cause cellular changes of varying intensity without necessarily showing a cytotoxic character. While investigating the cause of entrapment syndrome of the peripheral nerves in the elbow region, we observed variability of the pronator teres muscle and the relationship of this muscle to the median nerve and the surrounding vessels. Attention was also paid to the occurrence of the supracondylar process of the humerus and Struthers ligament with regard to their ontogenetic and phylogenetic development. For this purpose, a classical anatomical dissection of the upper limbs of 68 adults, three fetuses and a phylogenetic assessment of five mammalian species was performed. In terms of variability in the anatomical structures of the elbow region, we found the most serious clinical condition to be where the median nerve ran through the pronator canal together with the ulnar vessels (1.5%), or when it passed through the ulnar head of the pronator teres (5.9%). The pronator teres examined by us in fetuses showed the same arrangement as in adult individuals, including the created ulnar head. The occurrence of a supracondylar process and Struthers ligament was not observed in our collection. The presence of these structures was not confirmed during the fetal period, either. The phylogenetic part of the study re-opened the question of the meaning and function of the entepicondylar foramen, because we noted differences in the occurrence of this structure in two related genera with a very similar way of life (Djungarian hamster and golden hamster). Colorectal cancer (CRC) is one of the most frequent types of cancer in the world. Between tumor cells and the stroma mutual interconnections are established that favors the tumor development and metastasis. In this respect, the extracellular matrix is remodeled so that it may become totally different from a morphologic perspective than the stroma of the organ in which the tumor develops. Matrix metalloproteinases (MMPs) have an essential role in the remodeling of the tumor stroma. We assessed the expression of MMP-9 on a number of 31 stage III colorectal adenocarcinomas. Generally, MMP-9 had a high but inconstant expression in tumor cells. The highest expression was found in poorly and moderately differentiated carcinomas, with a lower expression in well-differentiated colorectal cancers. Occasionally, MMP-9 expression was identified also in peritumoral macrophages and in stromal cells. Metastasis-free lymph nodes had an intense positive reaction in both macrophages and lymphocytes. The intensely positive reaction was observed for the macrophages and lymphocytes in the tumor necrosis regions. The process of angiogenesis was generally correlated with the intensity of MMP-9 reaction. The occurrence of chronic myeloid leukemia (CML) and chronic lymphocytic leukemia (CLL) in the same patient is a rare event. In published literature, CML diagnosis follows CLL diagnosis or both leukemias are diagnosed simultaneously or rarely, CLL diagnosis follows CML diagnosis. We report the case of one patient with renal adenocarcinoma who was diagnosed with CLL 60 months after CML diagnosis. At that time, the patient was in complete cytogenetic response (CCyR) and major molecular response (MMR) of CML clone according to European LeukemiaNet (ELN) recommendations and presented clinical and hematological signs of progressive CLL clone. After 24 months of regular monitoring, the patient presented signs of CLL clone expansion. The FISH (fluorescence in situ hybridization) analysis for CLL prognostic factors, performed before treatment, was positive for tumor protein p53 (TP53) and 13q14.3 mutations. The Li-Fraumeni syndrome (LFS) was considered but TP53 mutation was considered acquired and patient s reduced overall, progression free and disease free survival might sustained that hypothesis. Imatinib (IM) was stopped and patient received chemotherapy until obtained a stable partial response. Twelve months after last cycle of chemotherapy, the patient received second line treatment due CLL clone progression signs but died due to neutropenia related complications. This article is the first Romanian report of CLL occurrence after CML diagnosis and as far as we know the fourth case report of such association in published literature. Spermatic cord liposarcoma is a rare medical condition and liposarcomas are most commonly found in the retroperitoneum, in the extremities and less often in the head and the neck area. The spermatic cord is a rare site of origin, accounting for about 3-7% of all liposarcomas. We report a case of liposarcoma of spermatic cord. A 62-year-old male patient presented with a painless right inguinal mass. MRI (magnetic resonance imaging) showed a fatty mass in the right inguinoscrotal region, and was interpreted as an inguinal hernia containing omentum protruding into scrotum. The mass was removed with right testis and spermatic cord. The surgical margins were negative. Histopathological examination and immunohistochemistry revealed a well-differentiated liposarcoma. In this article, we discuss the clinical behavior of the spermatic cord liposarcoma and currently recommended treatment of the spermatic cord liposarcoma by reviewing the literature. In conclusion, spermatic cord liposarcoma are rare neoplasm that present as firm, slow-growing palpable paratesticular masses and the surgical treatment should include a wide resection around the inguinal canal, with removal of the spermatic cord and the surrounding soft tissue deep to the internal inguinal ring. There are four embryonic anastomoses that exist between the internal carotid artery (ICA) and the vertebrobasilar (VB) system, which may fail to regress postfetal life; one of which is the trigeminal artery. Other persistent anastomoses include those formed by the hypoglossal, otic and proatlantic intersegmental arteries. In addition, other cerebrovascular variations may accompany a persistent primitive trigeminal artery (PPTA); such as arteriovenous malformations, aneurysms, carotid-cavernous fistulas and stenotic cerebral vessels. We present two very rare cases of a left PPTA. In the first case, there was a past medical history significant for cervico-thoraco-lumbar spondylitis and in the second case of an operated occipital astrocytoma. In both cases, the PPTA was associated with a fusiform aneurysm located in the carotidian (lateral) aspect of the PPTA as well as other cerebrovascular anatomic variations. In the first case, the length of the PPTA was 26.0 mm and its endoluminal diameter, at its origin at the ICA, was 1.8 mm; the aneurysm has a length of 8.4 mm. In the second case, the length of the PPTA was 31.0 mm and its endoluminal diameter at its origin at the ICA was 3.0 mm; the aneurysm have a length of 7.6 mm. Identification of these variant vessels should not be ignored before planning and execution of neurosurgeries to prevent possible perioperative risks. Introduction: The glial differentiation in pediatric supratentorial primitive neuroectodermal tumors (sPNET) is occasionally revealed by immunohistochemistry with GFAP (glial fibrillary acidic protein) as isolated positive cells among undifferentiated cells, indicative of divergent cellular phenotypes. Large malignant glial tumors in sPNETs are extremely rare and challenge the neuropathologist by raising the possibility of glioblastomas with sPNET-like features (GB sPNET). The distinction between them is important because of their different treatment and prognostic. Case presentation: A large parieto-occipital tumor with minimal ventricular invasion, in an 11-year-old girl, with a five-month clinical history, was proven to be a highly malignant biphasic tumor, consisting in a glioblastoma with giant cells, representing 75% of the tumor, and sPNET nodules, with one larger dominant nodule. The immunohistochemistry confirmed positivity for synaptophysin, neurofilament, neuron-specific enolase and CD56 in the sPNET compartment and for GFAP, CD56 and vimentin in the glioblastoma. In some parts of the tumor, the two components were well delineated from each other as in a collision tumor, but in others, the two different tumors were intermingled. It was histologically diagnosed as sPNET with double differentiation (glial and neural) or glioblastoma with sPNET-like features. Conclusions: These cases are very rare, few reported, especially in the pediatric population, and with high difficulties in histological differential diagnosis, subsequently reflected in the therapeutic decisions. The symptomatic choroidal metastasis is a rare manifestation of lung cancer. The aim of this study was to present a clinical case of choroidal metastasis associated with multiple intracerebral metastases from a papillary adenocarcinoma of the lung diagnosed simultaneously with its metastases. We present the case of a 40-year-old male patient, smoker, admitted to the Neurosurgery Clinic II, Prof. Dr. Nicolae Oblu Emergency Hospital, Iassy, Romania, for right hemiparesis, headache, right visual loss, dysphonia and swallowing disorders occurring six days earlier. Previous medical history showed that he was diagnosed with a stage IV cancer located in the lower lobe of the left lung a week before. Ophthalmoscopic examination of the right eye revealed total secondary serous retinal detachment. Contrast cranial-cerebral computed tomography (CT) scan revealed multiple lesions compatible with the diagnosis of supratentorial intracerebral metastases in the left hemisphere, as well as an intraocular choroidal metastasis. The rolandic brain tumor was surgically removed and the cyto- and histopathological exam established the diagnosis of an intracerebral metastasis from a papillary adenocarcinoma of the lung. After a week, the patient was referred to an oncology unit for the initiation of oncology and palliative care. We emphasize the importance of an ophthalmological screening of patients with intracerebral metastases in order to eventually identify a choroidal metastasis, as the recognition and early treatment of this entity could improve the quality of patient s life. Lichen sclerosus (LS) is considered to be a disease resulting of local immune dysregulation. A delayed-type hypersensitivity reaction and cell-mediated immune response are hypothesized to be the pathogenesis of granuloma annulare (GA). The case is presented of an uncircumcised 45-year-old man who developed lesions of LS and GA in his foreskin. Both processes were treated with circumcision. GA is rarely located in the foreskin. As far as we are aware, only one previous case presented this location. We describe herein for the first time LS associated with GA in the foreskin. Both processes have a common autoimmune pattern suggesting a link between them. Although we cannot exclude that comorbidity may be a coincidence, we think this combination of lesions is not just coincidental but significantly associated through immunopathological mechanisms. Acne fulminans is the most aggressive and destructive form of acne vulgaris, being also known as acne maligna. The onset is acute and systemic involvement is always present. Most commonly, acne fulminans (AF) occurs in male adolescents as a brutal complication of a preexisting mild or moderate acne. The etiology of AF remains incompletely elucidated. The skin lesions are polymorphic, the symptoms and clinical signs vary, and thus the diagnosis is not easy. In making a certain diagnosis of AF, histopathology has a decisive role. In this respect, we will present some of the most suggestive aspects of histopathology, immunohistochemistry and electron microscopy in a 16-year-old patient clinically diagnosed with AF. This patient presented on admission nodular inflammatory and ulcerative necrotic lesions on the face and chest, extremely, accompanied by significant myalgias and arthralgias. Aspiration pneumonia is a frequent cause of morbidity and mortality in children with neurological deficits. We present the case of a 4-month-old infant from the Foster Care Center, with severe psychomotor retardation, blindness, and associated cardiac malformation, who was admitted to the Pediatrics Clinic of the Emergency County Hospital of Craiova, Romania, presenting aspiration pneumonia and moderate respiratory insufficiency. Under sustained, early instituted treatment, the evolution was towards death. The chest radiography and histopathological examination of the pulmonary tissue confirmed the diagnosis. The neurological impairment was not only a favoring factor for aspiration, through the deglutition disorders, but it was also an aggravating one, through the bacterial colonization of the lungs. Failure of neural crest cells to migrate from neural crests during intrauterine development result in partial or total aganglionosis of the colon in newborn. Hirschprung s disease (HD) represents the clinical manifestation of this pathogenic process, currently accounting for the majority of lower intestinal obstruction in the first period of life. Our aim was to present a series of three cases presenting to our tertiary care center with a range of symptoms, all benefiting from surgery and consequent pathology examination of biopsy or resection pieces. The first case was of a male newborn that presented several years ago with common symptoms for HD (abdominal distension, vomiting and the total lack of intestinal passage for feces). Coming from young healthy parents after normal labor, the newborn displayed signs of Down s disease after physical examination. After abdominal radiography, the patient underwent surgery and consecutive pathology revealed notable signs of Crohn s disease (CD): massive stasis in the serosa and submucosa, chronic inflammatory infiltrate and lack of nervous cells in both plexuses and mucosa. Immunohistochemistry revealed low intensity CD34 membrane staining for fibroblast-like ganglion cells while CD117 staining showed few nervous cells within the mucosa. The second case presented before one year of age with an infectious background, already being operated upon with colostoma. We performed corrective surgery of the colostoma and consecutive pathology showed low CD117 cytoplasmic staining and intensely positive NSE (neuron specific enolase) staining within myenteric plexuses. Finally, the third and most recent case was that of a 4-year-old boy with an early diagnosis of megacolon and no previous surgery, who we evaluated by laparoscopy with five biopsies and consecutive S100 staining revealed a small number of nervous cells within nervous plexuses. In conclusion, an early diagnosis of HD is essential for successful therapeutic measures. Histology and, more recently, immunohistochemistry, represent the gold-standard procedures needed to objectify the diagnosis. 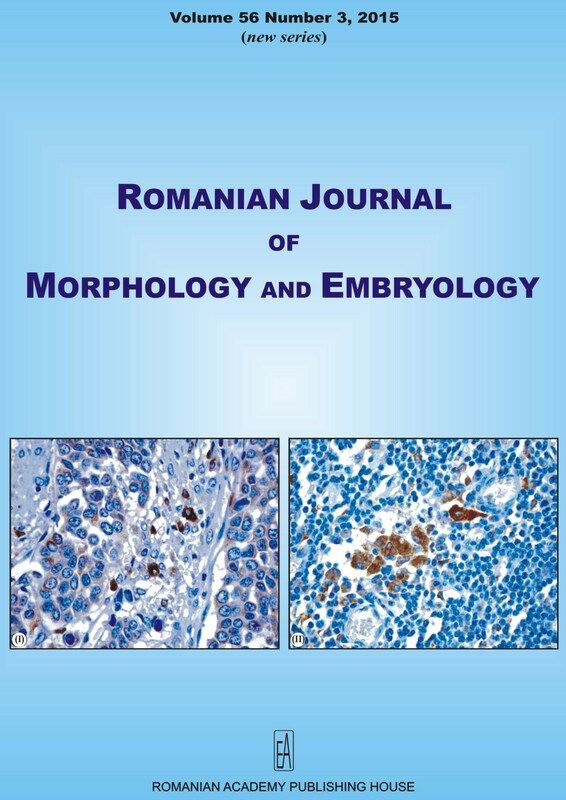 We present a case of brain abscess necroptically discovered in a 2-year-old child hospitalized in the Pediatrics Clinic of the Filantropia Municipal Hospital, Craiova, Romania. The family, with a poor financial situation, reports previous episodes that may be interpreted as comitial crises. Clinically speaking, he presents a height-weight hypertrophia, vitamin D loss rickets, and psychomotor retardation. At the objective examination, we found a weight of 10 500 g, second and third degree mesocardiac systolic beat and cardiomegaly in the thorax-cardiac-pulmonary X-ray examination. Despite the intensive treatment, death occurs few hours after hospitalization. During the autopsy, there is observed a partial dehiscence of the cranial arch sutures, with a 6/5 cm ovalary cavity in the parietal lobe, containing approximately 200 mL of yellow-green serous liquid, with uneven walls, but with no hemorrhagic or puss infiltrates. The heart is enlarged (in comparison to the general somatic development) of 9/7/4 cm, without any cardiac malformations. The microscopic examination showed degenerative neuronal and ischemic lesions on the left-brain hemisphere. Comparing to the data from specialty literature, we consider it as a yellow brain softening (according to Rokitansky s classification), most probably of an embolic cause. Cutis laxa (CL) or elastolysis is a rare inherited or acquired connective tissue disorder in which the skin becomes inelastic and hangs loosely in folds (Mitra et al., 2013). The clinical presentation and the type of inheritance show considerable heterogeneity (Shehzad et al., 2010). We aimed to present the atypical case of a young male patient diagnosed at 36-year-old with CL with systemic involvement. The complex medical history, with a suspected but unconfirmed progeria at nine months, repeated lung and urinary infections, complicated inguinoscrotal hernia, prostatic hypertrophy, bilateral entropion, colorectal diverticula and heart failure, suggested a systemic genetic disease, but the absence of family history made the diagnosis of CL difficult. The skin biopsy and the characteristic features discovered during anatomopathological exam made possible the positive and differential diagnosis, creating the link between the various organ involvement and CL diagnosis. Because of the age of our patient, of normal growth and mental development, and negative family history, we suspected an autosomal dominant form of CL with early onset and severe manifestation. Of course, we cannot exclude a recessive form, due to the heterogeneity of this disease. Umbilical cord knot (UCK) affects around 1% of pregnancies and tightening of UCK is a very rare and highly unpredictable complication of pregnancy that can lead to fetal demise or neonatal death. The majority of authors agree that very little could be done to prevent fetal deaths in pregnancies with undiagnosed tight UCK. We herein report the case of a 39-year-old, gravidity five, parity three, pregnant woman at 40 weeks and five days age of pregnancy, whose pregnancy evolved without complications and who was admitted to hospital for the management of the birth. Although the last ultrasound examination before birth showed a reversible arterial redistribution in the fetus dependent on the postural status of the pregnant women and other factors associated with umbilical cord knot were present, the diagnosis was missed because of the factors non-specificity. After a spontaneous labor without complications a dead male fetus, weight 3300 g, without heartbeat, Apgar score 0 was delivered. Macroscopic and microscopic findings confirmed that the cause of neonatal death was asphyxia caused by a tight UCK. The aim of our paper is to present the dramatic outcome of a pregnancy with a fetus with a tight umbilical cord knot (UCK), to bring to attention the signs that suggested the diagnosis, and to review the literature on this subject. Malignant melanoma is a type of skin cancer with accelerated evolution and a high metastatic potential, thus being the most aggressive type of skin tumor. Its origin resides in the epidermal melanocytes, which multiply chaotically, therefore becoming malignant cells. The main objective of this study was represented by the clinical, histological and also immunohistochemical analysis of a peculiar case of malignant cutaneous melanoma arised de novo. Patient M.H., age 54, was admitted due to concerns regarding a cancerous growth on the right scapula. Dermoscopy revealed an asymmetrical, polymorphic and polychromatic lesion; therefore, a surgical intervention was scheduled. The histological exam showed a microscopic structure resembling an epithelioid cell malignant melanoma, with inflammatory reaction and central ulcerations. Immunostaining with melanocytic differentiation markers revealed the presence of pagetoid-disseminated cancerous cells into the epidermis, in addition to deep dermis invasion and the extension of cancerous cells in and around the hair follicles. In most cases, malignant melanoma develops on pre-existent nevi, but it can also appear de novo with accelerated evolution, mainly at phototype I young people. The importance of this particular case consists in the fact that the tumors presented some unusual particularities: appearing on healthy skin tissue, with slow evolution, at an age when this pathology is rarely encountered; the patient was phototype III and the cutaneous territory had been rarely exposed to ultraviolet radiations. Therefore, the case has proven interesting and worthy of being taken into consideration by the appropriate literature. Multiple anatomical variants were encountered during a cone beam computed tomography (CBCT) study of the nasal cavity of a 43-year-old male patient. These were mostly related to the nasal turbinates, suggestive for an unusual development of ethmoturbinals. Pneumatized turbinates were observed: bilateral supreme, superior, and middle concha bullosa. There were bilateral paradoxically curved superior turbinates, as well as a unilateral paradoxically curved inferior turbinate. There was also found a unilateral accessory middle turbinate, presenting as a medially bent uncinate process. Due to the presence of the Santorini s concha, the natural ostium of the sphenoidal sinus was medial to it, and was not directly related to the superior turbinate. Such variants, alone or in combination, should be documented prior to surgical procedures, endoscopic or microscopic, by rhinologists and neurosurgeons, prior to various sinonasal or skull base approaches. Patients should be evaluated on a case-by-case basis, as the Vesalian anatomy could not apply to all. Purpose: The study aims to present the main ethical dilemmas that research on animals raised for anyone involved in this process, starting from the idea that there are rights of animals to be known and respected. Background: The evolution of medicine is inextricably linked to the production of new drugs, the occurrence of surgical techniques; none of these can be possible without the study of experimental animals, in vivo experimentation being part of the process of medical research. Content: The article analyzes the main ethical dilemmas related to the use of animals in medical research, in the current legislative context and historical perspective of achieving such studies. Discussion and Conclusions: The use of animals in medical research must be conducted in accordance with clearly established moral rules, which facilitate reducing to the maximum the negative effects on the animals, avoiding unnecessary suffering to them and especially to facilitate progress achievement with the minimum possible animals sacrificed. During the second half of the 19th century and the whole 20th century, numerous studies concerning the immune system were carried out using different methods of approach. In time, many methods were forgotten, because they were overwhelmed by more modern techniques. The aim of our paper is to present the researches done by the Romanian physician Professor Iuliu Moldovan (1882-1966) regarding one of the defense mechanisms of the human body, having the old name of reticuloendothelial system. Our paper is focused on his experiments done with Reticulin-M. He obtained this substance in 1923, by blocking the reticuloendothelial system of different animals with China ink. Moldovan considered Reticulin-M as a hormone produced by the reticuloendothelial cells. In our paper are also mentioned some important therapeutic effects of this substance on human patients having various diseases.